Sneakerheadz documents the intricate cultural and economic customs of Sneakerdom: an ever-expanding realm where a pair of second hand shoes (namely those of the Air Jordan variety) can fetch resellers up to $100,000. Mick Partridge and Little Miss Sunshine’s David T. Friendly trace the sneaker’s step from the retro-Converse soles of basketball legends competing at Rucker Park, to feet featuring on the runways of Paris Fashion Week. The filmmakers set out to school the masses on a prolific and fundamental aspect of popular culture. Cool kicks have everything to do with why it is now appropriate to don sports apparel whenever, wherever, whatever. The film kicks off with input from a variety of industry figureheads (Jeff Staple, Frank The Butcher, Vashtie Kola, Wale, Samantha Ronson) on what it means to be a sneakerhead. 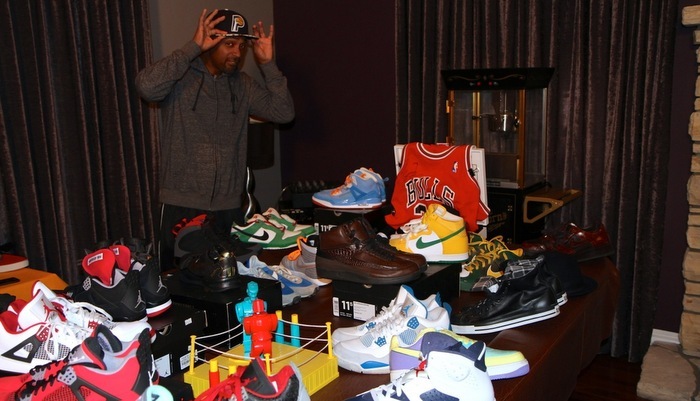 Essentially, sneakerheadz are avid sneaker collectors and/or sneaker enthusiasts. Sneaker hedonism is a spectrum phenomenon: a lightweight sneakerhead appreciates the culture and maintains a small share of live stock, four or five wearable pairs perhaps; those at the alternate end of the spectrum dedicate entire rooms and/or vaulted storage units to housing hundreds or thousands of pairs of Jordans, Yeezys, Cons, Shelltoes, NB 574s, Air Max etc. Individuals that fall under the latter category adhere to a “one pair to rock, one pair to stock” purchase policy when acquiring a design, thus the majority of these vast collections never get to see the cement. During pre-internet days, the journey to finding the freshest pair was as crucial as its end product. However, like coming to the realization that the Easter Bunny isn’t real, the ease of access provided by eBay has significantly dampened the magic of the sneakerhead hunt. The plot progresses to detail the sneaker’s transition from functional sportswear to staple fashion accessory. The origins of sneaker culture are traced back to the early 1970s when canvas Converse sneakers became the unofficial footwear of pro-athletes in the Harlem Rucker basketball tournament. With a desire to emulate their sporting idols, those sitting courtside rushed to their nearest sporting goods outlet. Spectators knew they would never come close to filling their heroes proverbial shoes but they could wear a pair that looked just like them. Diligent suppliers (the likes of Nike, Converse, Addidas, and Reebox) observed the phenomenon and bolted with it. To this day their marketing strategy remains unchanged: Just like Converse was Rucker Park and Kareem Abdul-Jabbar, Nike is the NBA, Jordan, and Lebron. Dream-peddlers are not limited to legends of sport either: Adidas is the upper echelons of Billboard, Pharrell, and Dr. West. The camera pans East and we get a thorough account of Japan’s preference for the sleek aesthetic stylings of the Air Max over the athleticism of the Jordan, and how this has impacted wider sneaker culture. 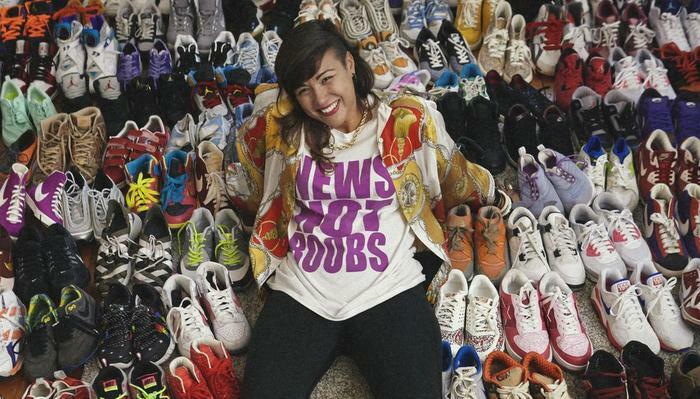 The juxtaposition of serious sneakerheadz from divergent cultural heritage emphasizes the ubiquity of sneaker culture. Back home, the violence associated with US sneaker release events is addressed and discussed in the context of standard sneakernomic custom: Demand >> supply. Sneakers are linked to 1000 deaths occurring annually, and Nike and Michael Jordan cop a lot of the blame for the manner in which they roll out their product (midnight releases, product scarcity, hype-building). Nike has received some very legitimate criticisms over the years but this is not one of them. Nike and Mr. Jordan can (and do) reach out to the families of victims of armed robbery when it involves their product. If they wanted to be truly proactive they could (and should) actively lobby for gun control. As Complex Magazine’s editor Russ Bengston points out, the manufacturers of popular cars are not expected to apologize for armed car-jackings. Serious sneakerheadz own pairs of shoes that are more valuable than luxury cars; therefore it is not surprising that, like luxury cars, sneakers are an aggressively sought out commodity. Immediately pending is an unnecessary and out-of-character segment attempting to demonstrate the good that sneakers, or more accurately Nike sneakers, do for the community via Nike’s association with the Doernbecher Children’s Hospital. This point is conveyed subtly throughout the film and needn’t have been printed out and underlined in bold Comic Sans. Indeed, the contributions made by Nike to the hospital are a good deed; however, the whole bit comes across like it was assembled at Nike’s HQ by a PR unit seeking to compensate for the company’s ties to the aforementioned death toll by parading their charity work with terminally ill children. This setback aside, Friendly and Partridge deliver a comprehensive and entertaining account of an oft unexplored subculture that should be seen by every person who’s ever copped a pair. Brittany has a Masters degree in psychology but is not social media savvy. Her interests include politics, hip-hop, and writing (for Silver Screen Riot.) Kiwi-born and raised keen on documentaries and South Park. This entry was posted in Documentaries, Out in Theaters and tagged David T. Friendly, Documentaries, Mick Partridge, Out in Theaters, Reviews, Sneakerheadz. Bookmark the permalink.